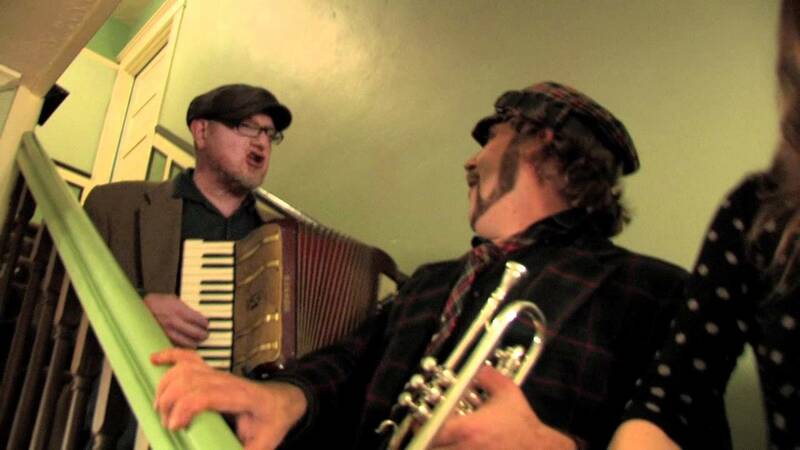 Trashcan Joe is an all acoustic vintage swing jazz band. Playing original music, and classic standards on home-made instruments. We're a favorite on the swing dance scene, and our educational programming is a hit with kids. With over 200 songs in our catalogue, we can tailor our performance to fit any situation! As an all acoustic band, we can play anywhere without electricity. We can also provide a sound system when more volume is needed. We perform at Festivals, Parties, Corporate Events, Park Concerts, Senior Facilities, Kid shows and more! 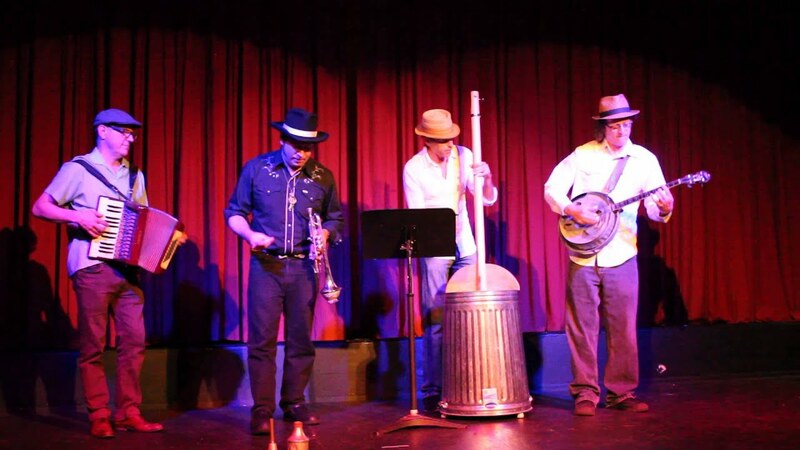 Trashcan Joe is an exciting live experience, theatrical and interactive with our audience. We can provide a band of professional musicians for any type of event. As an acoustic act, we can play ambient sounds for your party with classic movie soundtrack themes and sultry vocals, or bring a sound system and get everyone dancing to classic swing tunes! We have an educational program for kids, and we're just plain fun for everyone. As a band of singers and composers, we also integrate our own music seamlessly steeped in the genre. Trashcan Joe - A banjo made out of a trash can, or Trashcanjo. Captain James Cook has been building musical instruments out of found objects for the better part of two decades. Washtub Basses, Cigar Box Fiddles, Tin Can Sitars... but it was the Trashcanjo that sparked a revolution in musical recycling. A love for those old time jazz songs , and a dream to play them on home-made instruments, the Captain just needed a crew. 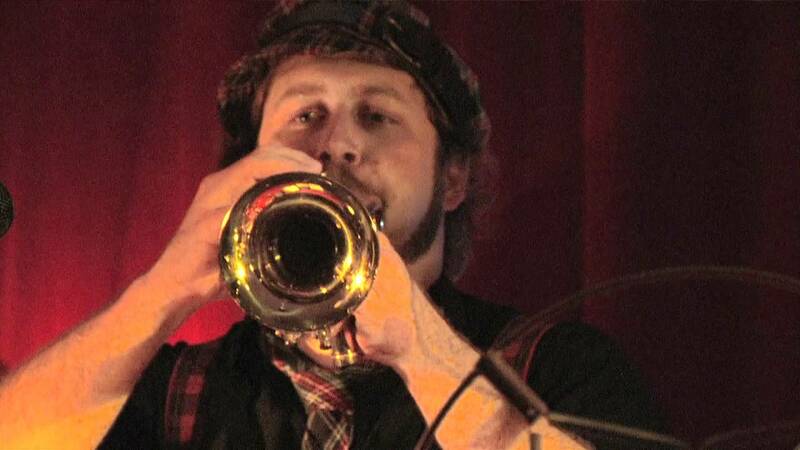 Joined by the fabulously entertaining Jason Wells on Cornet, Honey voiced Mike Danner on Accordion, the deep groove of Matt Voth on the Upright Tub Bass, and the sassy rhythms of Jen Forte on the Washboard. As if this wall of sound wasn't enough, everyone in the group sings both lead and backup throughout our extensive catalogue of both original music and classic standards. Trashcan Joe can play completely "Unplugged". Yes folks, even when all the electricity is gone, we will still be playing somewhere over in the corner. When we do plug in we use 7 microphones and a D.I. for the bass. That's about as "Tech" as it gets for us. As far as space requirement goes, line up five easy chairs with elbow room. We have 3 albums of original music and a seemingly endless book of classic standards. On any given night we may play "Fly Me To The Moon" or "It Don't Mean A Thing" mixed with the movie theme "Charade" or "Singing In The Rain". Our own compositions mirror our influences and blend together beautifully. Our influences have a broad range through an old-timey lens. Early Jug Bands, New Orleans Jazz, the greats like Ellington, Carmichael, Porter. Throw in some Country, Blues, and even an Italian tune or two.